Today, 17 years ago, our oldest son was born to us after having three daughters. I remember seeing the look on my husband Joe’s face when he told me “It’s a boy!” He loved his daughters too but was excited to have a son. Benjamin was only four pounds and thirteen ounces at birth and caught the flu at a few weeks old. He ended up in the hospital and went down to four pounds. He was just a tiny baby but now he is far from that. We will give him a tool chest on wheels with various tools tonight. He enjoys working with tools and doing construction work. Tonight in honor of Benjamin’s birthday, 20 to 25 youth will gather at our local Pizza Hut. Benjamin loves pizza so he will enjoy that and also being with his friends. Daughter Verena called Pizza Hut to reserve seats for all of them. I will need to make a cake for Ben but might wait until Saturday to have cake and ice cream since he won’t be home tonight. Benjamin didn’t have to go to work yesterday so he and our son Joseph were mowing our pasture field with our big walk behind mower. It helps keep the weeds out to mow it down every once in a while. Saturday we are having a “work frolic” for anyone who wants to come help us prepare for the wedding. Joe ordered material to insulate and finish the other end of the pole barn. We will use both parts of the building for the wedding and be able to spread out. Mose will be here to help but none of his family will be able to make it. Mose’s older brother Joe is getting married September 2 and that wedding will be at Mose’s parents’ house. They put up a new pole barn and are working on finishing that too. Hopefully we will get plenty of help to get a lot done. We also want to have someone put a roof coating on our barn roof. We are springing a few leaks, so that should help. Joe also ordered stain for our ramp and deck. We wanted to let the wood season awhile before we apply the stain. The wedding is three weeks away so we need to keep busy. Joe has to work Saturday in a week so that’s one Saturday less for him to get ready. I still haven’t made noodles for the wedding. Our chickens have not been laying so well. We have new ones started but they won’t lay eggs for a few months. We will butcher the older chickens and can the broth once the new hens are laying eggs. We like to get new hens every two years. I will use all my chicken broth I have left at the wedding so I will need more. The broth is used in the noodles and dressing. Sister Emma and sons were here assisting us with our work yesterday. She said I can have some of their eggs to make noodles for the wedding. I have had enough pickles to make three batches of freezer pickles. I am clear out of any canned or freezer pickles. Hopefully my plants keep doing well so I can restock with those. Plans are that church will be here in October so I want to have plenty of pickles. Today I want to try and get started sewing my dress for the wedding. I once again have put it off too long. Friday sisters Verena and Susan will come help me with some more cleaning. Daughter Elizabeth plans to come as well. On Friday, July 15, Joe and I will have our twenty-third wedding anniversary. Twenty-three years! How can that be possible? I am blessed to be married to a kind, loving husband. Every marriage has ups and downs but with God’s help it all ends up making our love stronger for each other. Without God in a marriage, I can’t imagine it working well. God’s love for us is unconditional. May He bless each of you! Cucumbers to make a few batches of Freezer Pickles. I store these in large containers in the freezer so when I have church I can serve them for the meal afterward. But I can also freeze them in smaller containers so we can eat them at home on sandwiches. It is really surprising how crisp they are. These pickles will stay good in the freezer for up to a year. They taste so fresh and crunchy. The making of these pickles does stretch out over three days, so plan accordingly! Day 1: Put the cucumbers, salt, and onion in a large bowl. Cover and refrigerate for 24 hours. Day 2: Drain the juice from the cucumbers. Combine the sugar and vinegar and stir to dissolve the sugar. Pour the mixture over the cucumbers. Cover and refrigerate for 24 hours. Day 3: Take the pickles out of the refrigerator and pack into a freezer-safe container(s). Pour the syrup over the pickles and freeze until ready to use. 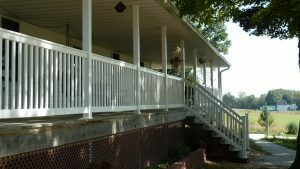 Lovina……your porch looks beautiful and so inviting. I can imagine sitting on a swing or rocking chair on it. Your pickle recipe looks easy enough that I plan to give it a try. Thank you for sharing it. It is indeed a restful, lovely place. We know that Lovina enjoys it there. When she can! Lovina, I would love to have a porch like yours to relax on in the evening after all the day’s work is done. 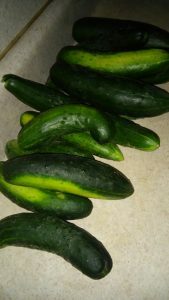 Thank You for sharing this pickle recipe, now I need to buy cucumbers to make it. I have a groundhog problem & can’t find anything that will deter them from coming in the yard. They’ve eaten all my cabbage & cucumber plants. Boo groundhogs and their appetites! Thanks for your comment and your faithful following of Lovina’s column.